Nationally celebrated as the first Australian martial arts film, this was also the first Australian-Hong Kong co-production, produced at the height of the international kung fu boom and during a mass resurgence in Australian film-making, mostly exploitative in nature. At the time, Hong Kong production companies like Shaw Brothers and Golden Harvest were making inroads into the European, American and Japanese markets using kung fu as their unique commercial weapon. Movies like Enter the Dragon (1973), the Hammer Film co-produced The Legend of the 7 Golden Vampires (1974), and blaxploitation efforts like Cleopatra Jones (1973) were money spinners designed to not only tap into the mass appeal of martial arts movies overseas but also, in some subliminal way, help to align Chinese heroes with the more commercially accepting western benchmark, and therefore helping to smooth out Asian relations abroad. Trenchard-Smith – a British ex-pat making his directorial debut – pursues a sub-James Bond set-up around Australia’s most striking landmarks, emphatically opening the film with a helicopter chase and fight scene with Sammo Hung on top of Uluru (then known by the colonial title of Ayers Rock), with Sammo throwing chunks of the sacred stone at his pursuer as he runs up the landmark’s steep incline. Hung is in Australia’s red centre to do a drug deal at the behest of Wilton (played by ex-Bond George Lazenby, thus furthering the film’s 007 connections), a gangster who runs a Sydney-based narcotics ring behind the guise of a martial arts school. 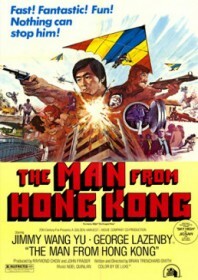 Wang Yu plays Inspector Fang from Hong Kong Special Branch – the titular man from Hong Kong – who is assigned to extradite Sammo before he is assassinated by Wilton’s men on his way to the courthouse. Fang is a lethal kung fu expert, much to the bewilderment of local cops Grosse and Taylor (played by Hugh Keays-Byrne and Roger Ward), whose methods are more The Sweeney than Enter the Dragon. “Talk about the yellow bloody peril,” Grosse remarks as the persistent Inspector chops his way through Wilton’s school in an attempt to capture his man. A crassly dubbed yet smartly dressed Wang Yu is a competent choice for international heroics, even if his martial arts skills never reach the high standards set by Bruce Lee or, later, Jackie Chan. Sammo Hung’s Golden Harvest stunt team crop up in scenes filmed and directed by Wang Yu in Hong Kong, but the action scenes are mostly a scrappy affair. Wang Yu’s depiction as something of a sexual Lothario takes even more convincing. Despite lacking charisma, he beds the only two female characters in the movie, contrary to the asexual nature of the heroes he plays in his traditional kung fu films. The first is an Aussie journalist who happens to hang glide into Hong Kong during one of the Inspector’s training sessions. The second is a veterinarian’s daughter who engages in the sort of frolicking love montage found in only the corniest of 70s pop videos. Given the increasingly relaxed policy towards Asian immigration to Australia in the 1970s, the racial politics is more jovial than prejudicial. The worst line belongs to Wilton – “I never met a Chinese yet that didn’t have a yellow streak” – but the line is said as a provocation. Western attitudes towards the Chinese are more sympathetic here than they are in a movie like, say, Rush Hour, which was filmed nearly 30 years later and is rife with racial slurs. For the most part, the film plays light and wild, and is still a lot of fun, with a cracking theme tune to boot: the big hit Sky High by Jigsaw.